Wish there was a crash course your student could take to prepare for the transition to university life? There is! That’s what Trent’s orientation programs are all about. Here’s a quick snapshot of each of these programs, including our one-of-a-kind summer orientation workshop for parents and supporters. 80 percent of students and their parents attend at least one orientation event at Trent. Summer Orientation: This one-day session is designed to introduce students and their parents/supporters to life at Trent. Featuring workshops delivered by student life professionals, academic advisors, and student leaders, the day includes a services fair, residence tours, course registration assistance, and a practical and informative session for parents/supporters of Trent students. Bring It On! : This fun and interactive weekend event gives incoming students the opportunity to connect with peers, upper-year student leaders, staff, and faculty while challenging themselves to try a variety of skill- and relationships-building activities. If you don’t think an orientation session could possibly include rock climbing, low ropes, or canoeing, that’s only because you’ve never had the chance to Bring It On! You’ll definitely want to encourage your student to be part of this very special late-summer event. Orientation Week: Orientation Week is a milestone event in the life of your student—their very first week at Trent. Your student will have the opportunity to explore the campus, tap into services and supports, meet other students, and discover everything that Trent has to offer in this far-reaching introduction to the world of academics and beyond. For First-Generation Students: Is your student the first member of the family to attend college or university? If the answer to that question is yes, then your student is a first-generation student. That entitles your student (and you) to some additional support. In particular, you’ll want to plan to take in the Student Experience Panel at Summer Orientation. It’s your chance to connect with upper-year First Generation students and their families and to tap into their wisdom and experience. Summer Academic Kickstart: This half-day session is designed to introduce students and their parents/supporters to life at Trent. 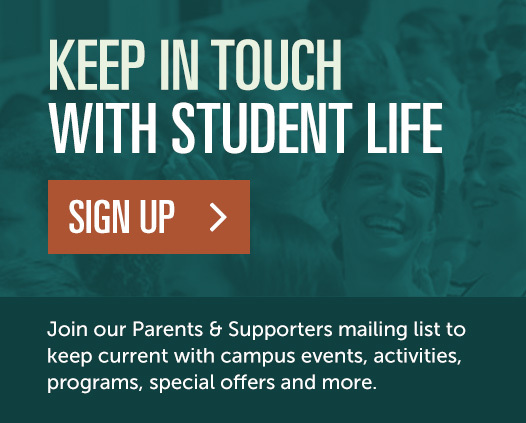 Featuring workshops delivered by student life professionals, academic advisors, and student leaders, the day includes information on academics, campus services, student life, money matters, course registration assistance, and an optional practical and informative session for parents/supporters of Trent students. Fall Start-Up Orientation: Trent University Durham’s orientation program is the first step in providing your student with the tools and information they need to start their University career off strong. Your student will have the opportunity to tap into supports, meet other students, explore the campus and services, and discover everything that Trent University Durham has to offer. First-Year Experience Certificate: The First Year Experience Certificate Program is a six-week developmental program designed to provide students an opportunity to strengthen skills to increase academic success. Each session is interactive in nature and covers topics such as life skills, social development, career exploration, goal setting, and more. Eager to head to Trent? Here’s what you need to know about getting to Trent and finding your way around campus.